Rink & Robinson,PLLC has 58 plus years of guiding clients through an ever- changing landscape. 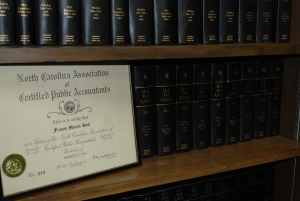 Rink & Robinson, CPA’s was started as Hoffman and Rink founded by Francis M. Rink and the late George A. Hoffman in Hickory, NC. Rink & Robinson, CPA’s grew to a staff and partners of seven. After Hoffman’s retirement, Bobby Robinson joined the firm as a partner in 1972, thus the name Rink & Robinson, CPA’s. Michael E. Rink, Partner, introduced computers to the firm. He was the first to bring computers to an accounting firm in the Western North Carolina area. Bobby Robinson retired and Francis M. Rink along with son Michael became partners and decided to keep the Rink & Robinson, CPA name. The firm experienced exponential growth. It increased its staff members and tripled its revenue. Rink & Robinson, PLLC became a limited liability partnership and was known not only as certified public accountants but also as business management consultants. Rink & Robinson, PLLC became a driving force in the medical industry by providing a specialized consulting division that assisted physicians and medical specialty practices in growing their business. Co-Founder of Rink & Robinson, CPA’s , Francis M. Rink retired at the age of 75. The firm added two partners, Justin D. Rink, son of Michael E. Rink along with long-term staff member Richard F. Cardiff. Rink & Robinson, PLLC suffered a tragic loss of one of their partners, Justin D. Rink. The staff members of Rink & Robinson, PLLC will greatly miss their colleague. Justin was a partner in the firm and a beloved son of Michael E. Rink. Rink & Robinson, PLLC continues to grow and expanded its services to fill the needs of specific industries. The partners participate in multiple industry oriented seminars as a part of their continuing education. The additional training is to meet the needs of the specialty clients.